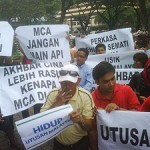 utusan is racist and fanatic – welcome! no, that doesn’t comes from me (though i thoroughly agree) but from ex utusan journalist, hata wahari, during a forum entitled ‘media and ethnicity: overcoming the challenges’ at han chiang college, penang on 21 may. i went to the forum with… surprise… a priest… fr joe matthews. actually i intended to go alone. it was after the susnet mass celebrated by fr. joe, that i was waiting for my friends to go dinner, then my friend will drop me at han chiang, when fr joe spotted me and asked who was i waiting for so i told him i’m going to a media forum and he was interested to attend too, so immediately i went with him in his car. the first person i met was CIJ director, masjaliza (or mas, as she is fondly knonw). she was very glad to see me and we hug on greteing. i asked her whether hata had arrived and she said yes, so i went over to say hi to hata – introducing myself as ‘malaysiakini citizen journalist’.’ i guess people were quite surprised to see the presence of a priest as fr joe was in his brown priest robe (capuchin order). however, there were not many people at the forum. only about 30 persons i think and more than half of them were reporters or works in the media field. carolyn, my fellow CJ was there and i was surprise to find out she was the MC! well done, carolyn. well she’ was also the videographer and photographer! ok about this forum. it was one of the activity organised in conjunction of world press freedom day. the 3 speakers for the forum were hata, ex utusan journalist and NUJ chief, himanshu bhatt, penang chief editor from the sun and dr carmen nge from UTAR. the first person to speak was hata but he only spoke 5 mins! he started by saying utusan is a racist and fanatic paper. “what utusan wrote, nobody will accept, except umno.” he said. so true. utusan controlled by umno, so that we know for a fact. he suggested that utusan should be suspended for 3 months. he said more later on during the Q&A time, thrown to the floor. 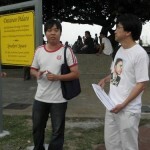 you can read what he said at the forum from susan loone’s article at malaysiakini. himanshu gave an interesting address. he talked about multi-culturism in journalism. he gave a few examples of incidents where one can report on both sides (race/religion). however, sometimes, some of these report were not accepted by the editor. taking the cow-head protest as one example, he said that a reporter had interviewed some of the malay houses in the area and they showed support for the hindu temple not to be re-located but this was not publishsed in the paper. himanshu also said that the media operates on two planets. in carmen’s address, she surprised the audience when she said utusan is not the only racist paper as she believe all papers are racist. she was talking more about the language based paper. she said that usually if it is a chinese paper, the news will slant more to the chinese community, and if an indian paper, slant to the indian community. likewise with malay paper. i guess it’s true what she said. well i had been saying anyway that all of us are racist in on way or another. .. the question is only to what extend…. not to be so blatantly racist or to the extend of provoking. she also talked a lot about the ‘language problem’ when reporting. she said for example if a press ocnference is in english and there are chinese speaking reporters there, not understand what were going on, they will asked the english speaking reporters, thus they don’t get the news direct but translations from the english speaking reporters, thus the news that comes out in their paper won’t be exactly the true picture of what had transpired. this meant, she said in her summing up, that the paper received ‘second hand’ news. according to her, it would be good if reporters knows all languages to able to made an accurate report, when they are attending press conference of different languages. one thing i find it interesting was when she said the media usually focus on politicians and VIPs or prominent people, and not on the ordinary people, as i totally agree. she meant only ‘big’ news like protests, price hikes, govt. projects and so on (not news that focus on community, environment). for this type of news, reporters will only interview the politicians and prominent people, neglecting the ordinary public, who were involved in one way or another. take the example where himanshu gave the cow-head incident – we read many reports on what polticians said or what the NGO said but the residents themselves were forgotten. 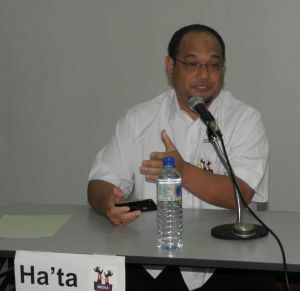 hata, when asked how he survived 16 years in utusan, responded that utusan only turned for the worst after 2008. he mentioned one of the past editor of utusan… not so sure of the name… think it was khalid something… was a good editor, and that he had been around, he would not let these ‘kind of thing’ (what utusan publish nowadays) to be published. he also mentioned that once utusan got hold of any news that is negative or against PR, they will immediately publish it front-page. ahh… that we too knew about it all along. hata was asked about the paper he’s going to start – utusan rakyat. somebody from the floor said that as long as PKR people (eg nurul) were involved, the govt. will never give the permit. hata said at the moment, the best solution is to shut down (suspend) utusan for 3 months – to let the editors and reporters feel the pain. he said that if the govt. 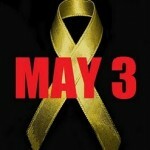 can suspend the star, sin chew and watan for 3 months during the operasi lallang, why can’t they suspend utusan now. there should be no double standard. but of course we all know there wouldn’t be any action at all on utusan. i noted that hata’s english is not so good, so sometimes i can’t catch what he was saying. well of course since he is a malay journalist, writing for a bahasa language paper. the organisers should have asked him to speak in bahasas if he felt more comfortable with it. during the Q&A time, there were quite a number of people asking questions or giving comments. i notice there were 3 people from the CM press office. by the time it was Q&A time, it was already near 11.00pm, so in the end the Q&A time had to be cut short. they started quite late too lah, that’s why it ended late. the time scheduled to start was 8.30pm. i notice nowadays the organisers like to start forums at 8.30pm… so they said after muslim prayers time. but you know lah how malaysians are… never start on time. 8.30pm scheduled time but dilly dally, it started near 9.00pm. well after the forum, i seek susan out as she had so kindly agreed to give me a lift home earlier. susan, however, linger on to chit chat with hata and some other organisers/audiences who stayed back. i joined in some small chat with susan, hata and dr mustafa (from aliran). from this chit chat i realised that hata is sort of a jovial happy go lucky fellow. he was not sore at all about being sacked… he said he expected it so… lived with it. his english is not so good, so it is no surprise that in our chit chat, from english, he broke into bahasa. all of us speak with him in bahasa too of course. after the organisers pack up, mas wanted to go for supper and asked suggestions from us penang folks (beside mas and hata from KL, carmen is also from KL and there were 2 others from CIJ, one whom i know – chuah siew eng). being KLites, they were dying for penang food, so insist on going for supper. someone recommended the famous sup hameed at penang road, so off we went there. susan, i, chia ming (malaysikini reporter chinese section) and his girlfriend, bernard – were from nanang, while hata, mas, carmen, siew eng and one lady i didn’t get her name – 5 of them were from KL. i took the sup kambing. very yummy! shared some with susan who first took the maggi mee goreng. she found it very nice that she decided to order a bowl (sup kosong, without the meat) and i got greedy, i also order another bowl – this time sup kosong. i love soup actually, any kind of soup. all those from KL also order soups! we were there enjoying our soup and having a very good chit chat until past 1.00am. poor susan had to drop me so far, when i reach home it was near 2.00am so this means susan will reach home after 2.00am! THANKS a lot, susaan for the lift. appreciate your friendship.